Lou Marconi is an American professional wrestler. Lou marconi made his debut in 1992 and has wrestled for many promotions, including PWX, SCW, NWA, AIW, and the WWE. February 12, 1994 – CAPW: American Patriot defeated Lou Marconi. June 11, 1994 – CAPW: Lou Marconi defeated Frank Stalletto. August 23, 1994 – SCW: Lou Marconi defeated Lord Zoltan. Derek Stone and Lou Marconi defeats Frank Stalletto and Futureshock to win the tag team titles. October 8, 1994 – SCW: Lou Marconi defeated Frank Stalletto. December 17, 1994 – SCW: Frank Stalletto and Futureshock defeated Derek Stone and Lou Marconi to win the tag team titles. March 17, 1995 – SCW: Futureshock defeated Lou Marconi. Black Cat and Lou Marconi defeated Frank Stalletto and Futureshock to win the tag titles. March 18, 1995 – SCW: Lou Marconi defeated Frank Stalletto. March 19, 1995 – SCW: Black Cat and Lou Marconi defeated Frank Stalletto and Futureshock to retain the tag titles. March 26, 1995 – SCW: T. Rantula defeated Lou Marconi. April 7, 1995 – WrestleFest: Frank Stalletto defeated Lou Marconi. April 9, 1995 – Deaf WrestleFest: Juicer and Preston Steele defeated Black Cat and Lou Marconi. May 6, 1995 – SCW: Black Cat and Lou Marconi defeated Frank Stalletto and Paul Atlas to retain the tag team titles. August 26, 1995 – SCW: Randy Rogers defeated Lou Marconi in the 1st round. October 21, 1995 – SCW: Frank Stalletto and Stevie Richards defeated Black Cat and Lou Marconi to win the tag team titles. November 11, 1995 – SCW: Frank Stalletto and Lou Marconi defeated Stevie Richards and The Blue Meanie to win the vacant tag team titles. April 13, 1996 – Wrestling in Barberton: Frank Stalletto and Lou Marconi defeated Kenny Hendrix and Ron Cumberledge to retain the tag team titles. April 20, 1996 – SCW: T. Rantula defeated Lou Marconi. April 21, 1996 – Deaf WrestleFest: Stevie Richards and The Blue Meanie defeated Frank Stalletto and Lou Marconi to win the SCW tag team titles. June 15, 1996 – SCW: Lou Marconi defeated T. Rantula. August 19, 1996 – RAW: Frank Stalletto defeated Lou Marconi in a dark match. August 24, 1996 – SCW: Frank Stalletto and Lou Marconi defeated Dave and Dean Danger. T. Rantula defeated Lou Marconi. August 25, 1996 – Superstars: Tag team champions The Smoking Gunns (Bart Gunn and Billy Gunn) defeated Frank Stalletto and Lou Marconi to retain. September 7, 1996 – PWX: Black Cat and Paul Atlas defeated Lou Marconi and Stevie Richards to retain the tag team titles. September 20, 1996 – SCW: Lord Zoltan defeated Lou Marconi to retain the SCW junior heavyweight title. September 21, 1996 – SCW: Lou Marconi defeated Paul Atlas. September 22, 1996 – Superstars: Marc Mero defeated Lou Marconi. September 22, 1996 – SCW: Stevie Richards defeated Lou Marconi. October 27, 1996 – Superstars: Steve Austin defeated Lou Marconi in a dark match. November 22, 1996 – PWX: Lou Marconi defeated Big Daddy Adams to win the North American heavyweight title. December 13, 1996 – PWX: Paul Atlas defeated Lou Marconi by DQ. Lou Marconi retains the North American heavyweight title. December 14, 1996 – PWX: Lou Marconi defeated Paul Atlas to retain the North American heavyweight title. January 4, 1997 – PWX: Lou Marconi defeated Bubba the Bulldog to retain the North American heavyweight title. February 21, 1997 – PWX: Dennis Gregory defeated Lou Marconi to win the North American heavyweight title. March 7, 1997 – PWX: Blue Meanie, Col. Payne, JB Destiny and Stevie Richards defeated Adam Flash, Axl Rotten, Frank Stalletto and Lou Marconi. March 8, 1997 – PWX: Lou Marconi defeated Brian Anthony. April 5, 1997 – PWX: Lou Marconi defeated JB Destiny to retain the TV title. May 24, 1997 – PWX: Lou Marconi defeated Paul Atlas. T. Rantula defeated Lou Marconi in a falls count anywhere match to retain the heavyweight title. May 30, 1997 – PWX: Lou Marconi defeated Quinn Magnum to retain the TV title. May 31, 1997 – PWX: Lou Marconi defeated Brian Anthony to retain the TV title. August 2, 1997 – ECW: Bam Bam Bigelow defeated Lou Marconi. August 22, 1997 – PWX: PWX TV champion Lou Marconi defeated Lou Marconi defeated Benson Lee to retain to unify the TV title and the North American heavyweight title. October 3, 1997 – PWX: Dennis Gregory defeated Lou Marconi to win the TV title. October 10-11, 1997 – ECW: Al Snow defeated Lou Marconi. January 17, 1998 – ECW: Danny Doring defeated Lou Marconi. January 18, 1998 – SCW: The Blue Meanie defeated Lou Marconi. February 8, 1998 – SCW: Cactus Jack and The Blue Meanie defeated Frank Stalletto and Lou Marconi to win the vacant tag team titles. March 8, 1998 – SCW: Reckless Youth defeated Christian York and Lou Marconi in a 3-way match to retain the junior heavyweight title. April 5, 1998 – SCW: Lou Marconi defeated Christian York. April 19, 1998 – SCW: Christian York defeated Joey Matthews, Lou Marconi and Mike Quackenbush in a 4-way match to win the vacant heavyweight title. May 1, 1998 – SCW: Lou Marconi defeated Tom Brandi to win the heavyweight title. May 22, 1998 – SCW: Lou Marconi defeated Tom Brandi by disqualification to retain the heavyweight title. May 24, 1998 – SCW: Lou Marconi defeated Julio Sanchez to retain the SCW heavyweight title. July 31, 1998 – SCW: Lou Marconi defeated Dennis Gregory to retain the heavyweight title. August 28, 1998 – SCW: Dennis Gregory defeated Lou Marconi. September 27, 1998 – SCW: Lou Marconi defeated Dennis Gregory to retain the heavyweight title. October 3, 1998 – SCW: Lou Marconi defeated Dennis Gregory to retain the heavyweight title. October 10, 1998 – SCW: Tom Brandi defeated Lou Marconi in a I Quit match. October 18, 1998 – SCW: Lou Marconi defeated Toby Cline. Lou Marconi defeated Dennis Gregory to retain the heavyweight title. November 22, 1998 – SCW: Lou Marconi defeated Scotty Fox. Dennis Gregory defeated Lou Marconi to win the heavyweight title. January 16, 1999 – SCW: The Blue Meanie defeated Lou Marconi by DQ. Lou Marconi retains the TV title. January 17, 1999 – SCW: The Blue Meanie defeated Lou Marconi to win the TV title. February 21, 1999 – SCW: Joey Matthews and Christian York defeated Lou Marconi and Mike Quackenbush to retain the tag team titles. March 1, 1999 – RAW: Lou Marconi defeated Sean Casey in a dark match. April 1, 1999 – SCW: Joey Matthews defeated Lou Marconi. Dennis Gregory and Lou Marconi defeated Christian York and Joey Matthews to win the tag titles. May 15, 1999 – Break the Barrier: Mike Quackenbush defeated Don Montoya and Lou Marconi in a 3-way match to win the vacant Lord of the Dance title. May 20, 1999 – SCW: Lou Marconi defeated Joey Matthews to win the TV title. Tom Brandi defeated Lou Marconi to win the TV title. May 21, 1999 – SCW: T. Rantula defeated Lou Marconi in a street fight. June 5, 1999 – SCW: Dennis Gregory defeated Lou Marconi. June 19, 1999 – SCW: Cody Michaels and Shane Douglas defeated SCW tag team champions Dennis Gregory and Lou Marconi by DQ. Gregory & Marconi retains. July 31, 1999 – Shotgun Saturday Night: Test defeated Lou Marconi. August 14, 1999 – SCW: Christian York defeated Lou Marconi to become # contender for the junior heavyweight title. October 7, 1999 – PWX: The Kaplacks (Brandon K and Vince Kaplack) defeated Chris Hero and Lou Marconi. October 21, 1999 – PWX: Lou Marconi defeated Dirk Ciglar. November 27, 1999 – Jakked: Mideon defeated Lou Marconi. March 25, 2000 – PWX: Kingdom James defeated Lou Marconi. April 7, 2000 – PWX: Lou Marconi and Paul Atlas vs. Bigg and Kingdom James ended in a no contest to retain the tag team titles. June 3, 2000 – PWX: Lou Marconi defeated Chris Hero in the 1st round. Lou Marconi defeated Paul Atlas in the semi-finals. Lou Marconi defeated Brian Anthony to win the tournament and PWX heavyweight title. June 17, 2000 – PWX: Lou Marconi vs. Brian Anthony ended in a no contest to retain the PWX heavyweight title. July 15, 2000 – PWX: Lou Marconi defeated Brian Anthony and Chris Steele in a 3-way match to retain the heavyweight title. July 28, 2000 – PWX: Lou Marconi defeated Chris Hero to retain the PWX heavyweight title. August 11, 2000 – PWX: Lou Marconi defeated Cody Hawx to retain the PWX heavyweight title. August 25, 2000 – PWX: Lou Marconi defeated J-Rocc to retain the PWX heavyweight title. September 22, 2000 – PWX/PWL: Vince Kaplack defeated Lou Marconi to win the PWX heavyweight title. May 1, 2005 – CAPW: JT Lightning and Sterling James Keenan defeated Jason Bane and Lou Marconi. June 5, 2005 – CAPW: Jason Bane defeated Lou Marconi. August 13, 2005 – IWC: Lou Marconi defeated The Deviant. August 21, 2005 – AIW: Lou Marconi defeated Josh Prohibition to become #1 contender for the Absolute title. November 13, 2005 – AIW: Lou Marconi defeated The Thrillbilly to win the Absolute title. December 4, 2005 – CAPW: Lou Marconi, Nick Tatum, Ryan Reicz and The Canadian Bad Boy defeated Barry Saggitarious, Johnny Blaze, Michael Hellborn and Thor Killgore. December 11, 2005 – AIW: Lou Marconi defeated JT Lightning to retain the Absolute title. January 8, 2006 – CAPW: AERO, Dios Salvador and JT Lightning defeated Lou Marconi, The Bouncer and The Ironman. February 12, 2006 – CAPW: Lou Marconi ans The Ironman defeated AERO and Christian Faith. February 26, 2006 – AIW: Vincent Nothing defeated Lou Marconi to win the Absolute title. March 26, 2006 – AIW: Raymond Rowe defeated Lou Marconi. September 20, 2008 – PWX: Leviathan and Lord Zoltan defeated Frank Stalletto andLou Marconi. May 3, 2009 – Deaf WrestleFest: Dominic DeNucci, Dr. Cody Michaels and Shane Douglas defeated Frank Stalletto, JJ Dillon and Lou Marconi. May 9, 2009 – Firestorm Pro: Lou Marconi defeated Nickie Valentino. July 10, 2009 – Firestorm Pro: Lou Marconi defeated Matthew Justice. August 21, 2009 – Firestorm Pro: Lou Marconi vs. Shane Taylor ended in a double count-out. September 26, 2009 – PWX: Lou Marconi defeated Robert Parker Williams. October 2, 2009 – Firestorm Pro: Lou Marconi defeated Tim Greene. Lou Marconi defeated M-Dogg 20. November 25, 2009 – Firestorm Pro: Lou Marconi defeated Shane Taylor. December 12, 2009 – IWC: Shane Douglas & The Blue World Order (Blue Meanie and Nova) defeated Frank Stalletto, Lord Zoltan and Lou Marconi. December 30, 2009 – Firestorm Pro: Shiima Xion defeated Lou Marconi by DQ. February 5, 2010 – Firestorm Pro: Raymond Rowe defeated Lou Marconi to retain the heavyweight title. March 19, 2010 – Firestorm Pro: Lou Marconi defeated Shiima Xion. May 2, 2010 – Deaf WrestleFest: David Sammartino and Larry Zbyszko defeated Frank Stalletto and Lou Marconi by disqualification. May 21, 2010 – PWX: Ryan Mitchell defeated Lou Marconi by disqualification to retain the NWA East Three Rivers title. June 5, 2010 – PWX: Frank Stalletto, Lou Marconi and Will Esquire defeated Mad Mike, Piston Wiley and Sabotage. June 25, 2010 – Firestorm Pro: Tim Greene defeated Lou Marconi. July 16, 2010 – PWX: The 216 Clique (Dan Lennox, Frank Stalletto, Lou Marconi and Will Esquire) defeated Ryan Mitchell in a handicap match. August 1, 2010 – Firestorm Pro: Lou Marconi defeated J-Rocc. August 6, 2010 – PWX: Stryder defeated Lou Marconi in the 1st round. August 20, 2010 – PWX: Lou Marconi defeated Troy Lords to retain the NWA East 216 title. September 10, 2010 – Firestorm Pro: Lou Marconi defeated Shiima Xion to qualify for the championship match in a last man standing match. Patrick Hayes defeated John McChesney, J-Rocc, Lou Marconi, Matt Cross, Rufio Rapier and Shane Taylor in a 7-way anything goes match to win the vacant heavyweight title. September 11, 2010 – PWX: Lou Marconi defeated Troy Lords to retain the NWA East 216 title. September 25, 2010 – PWX: Lou Marconi defeated Ryan Mitchell in a submission match to retain the NWA East 216 title. October 9, 2010 – PWX: Patrick Hayes and Stryder defeated The 216 Clique (Frank Stalletto and Lou Marconi). October 23, 2010 – PWX: Stryder defeated Lou Marconi and Patrick Hayes in a 3-way match to win the NWA East 216 title. November 6, 2010 – PWX: Chris Taylor, Jon Burton & Ryan Mitchell vs. The 216 Clique (Dan Arkham, Frank Stalletto & Lou Marconi) ended in a no contest. November 20, 2010 – PWX: Lou Marconi vs. Ryan Mitchell ended in a no contest. December 18, 2010 – PWX: Chris Taylor vs. Lou Marconi ended in a double pin to retain the NWA East heavyweight title. January 8, 2011 – GOUGE: Otto Schwanz defeated Lou Marconi. March 11, 2011 – PWX: Chris Taylor defeated Lou Marconi to retain the NWA East heavyweight title. April 9, 2011 – GOUGE: Vordell Walker defeated Lou Marconi. April 14, 2011 – GOUGE: Lou Marconi defeated Rob McBride. May 1, 2011 – Deaf WrestleFest: Dennis Gregory vs. Lou Marconi ended in a time limit draw. May 21, 2011 – PWX: Lou Marconi defeated Ashton Amherst. June 10, 2011 – PWX: Stryder defeated Ashton Amherst and Lou Marconi in a 3-way match to retain the NWA East heavyweight title. June 25, 2011 – GOUGE: Lou Marconi defeated Rob McBride. July 23, 2011 – PWX: Ashton Amherst defeated Bigg, Dash Bennett, Devin Devine, Lou Marconi, Paul Atlas and Scottie Gash in a 7-way match to become #1 contender for the NWA East heavyweight title. August 12, 2011 – PWX: Shane Taylor, Ashton Amherst and JR Mega defeated Lou Marconi, Patrick Hayes and Stryder. September 3, 2011 – PWX: JR Mega defeated Lou Marconi. September 8, 2011 – GOUGE: Jimmy Jack Funk Jr. defeated Lou Marconi. Jimmy Jack Funk Jr., Rob McBride and Seymour Snott defeated Lou Marconi, Mickey Gambino and Otto Schwanz. September 24, 2011 – GOUGE: Lou Marconi defeated Blue Dewey. October 8, 2011 – GOUGE: Otto Schwanz defeated Lou Marconi. October 29, 2011 – GOUGE: Lou Marconi defeated Mike West and Vector in a 3-way match. November 19, 2011 – GOUGE: Lou Marconi defeated Mike West. January 21, 2012 – GOUGE: Rob McBride, Seymour Snott and Sideshow Phil defeated Frank Stalletto, Lou Marconi and The Masked Gumba. February 25, 2012 – GOUGE: Rob McBride and Seymour Snott defeated Frank Stalletto and Lou Marconi to retain the tag team titles. March 3, 2012 – GOUGE: Lou Marconi defeated Seymour Snott. April 14, 2012 – GOUGE: Jimmy Jack Funk Jr. defeated Lou Marconi to retain the heavyweight title. April 27, 2012 – Clash of the Champions: Justin Sane and Lord Zoltan defeated Frank Stalletto and Lou Marconi to win the Steel City tag team titles. May 5, 2012 – GOUGE: Lou Marconi defeated Mike West. Lou Marconi defeated Seymour Snott in a death match. June 7, 2012 – GOUGE: Jimmy Jack Funk Jr. defeated Lou Marconi to retain the heavyweight title. June 12, 2012 – NWA Fusion: Preston Quinn defeated Lou Marconi. June 23, 2012 – GOUGE: Jimmy Jack Funk Jr. defeated Lou Marconi to retain the heavyweight title. July 4, 2012 – GOUGE: Seymour Snott defeated Lou Marconi. July 14, 2012 – GOUGE: Lou Marconi defeated Jimmy Jack Funk Jr. to win the heavyweight title. July 21, 2012 – NWA Fusion: Pat Cusick and Ryan Zane defeated Lou Marconi and Sabbath by disqualification in the 1st round. August 18, 2012 – NWA Fusion: Pat Cusick defeated Lou Marconi. August 25, 2012 – GOUGE: Lou Marconi defeated Seymour Snott to retain the heavyweight title. Lou Marconi defeated Mike West to retain the heavyweight title. December 1, 2012 – NWA: Lou Marconi defeated Jimmy Parker to become #1 contender for the NWA Mid-Atlantic heavyweight title. February 2, 2013 – NWA Edge: Damien Wayne defeated Lou Marconi to retain NWA National heavyweight title. February 16, 2013 – NWA: Lou Marconi defeated Mickey Gambino. March 16, 2013 – NWA Edge: Justin Kaos and Lou Marconi defeated C-Block and Krotch. June 8, 2013 – NWA: Damien Wayne and The Human Predator vs. Lou Marconi and Pat Cusick ended in a no contest. August 23, 2013 – PWX: Chris Taylor defeated Lou Marconi in the 1st round. 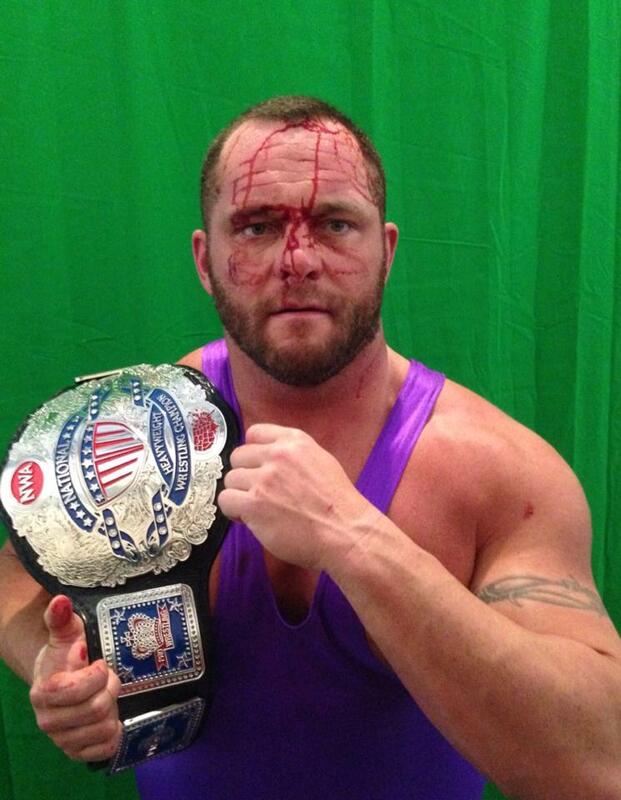 October 18, 2013 – NWA Houston: Lou Marconi defeated Raymond Rowe to retain the NWA Eastern States heavyweight title. October 19, 2013 – NWA BOW: Davey Boy Smith Jr. and Lance Archer defeated Damien Wayne and Lance Erikson, Alex Reigns and James Claxton & Raymond Rowe and Lou Marconi in a 4-way tag team elimination match. January 19, 2014 – NWA CIW: Lou Marconi defeated Trey Miguel to retain the NWA Eastern States heavyweight title. February 15, 2014 – NWA CIW: Malice defeated Lou Marconi to win the NWA Eastern States heavyweight title. March 1, 2014 – NWA Rage: Lou Marconi defeated Phil “Nitro” Monahan to win the NWA national heavyweight title. March 7, 2014 – NWA Smoky Mountain: Lou Marconi defeated Lance Erikson to retain the NWA Eastern States heavyweight title. March 21, 2014 – NWA: Phil “Nitro” Monahan defeated Lou Marconi to win the NWA national heavyweight title. March 22, 2014 – NWA: Lou Marconi defeated Phil “Nitro” Monahan to win the NWA national heavyweight title. April 5, 2014 – NWA: Phil “Nitro” Monahan defeated Lou Marconi to win the NWA national heavyweight title. April 19, 2014 – NWA CIW: Phil Monahan vs. Lou Marconi ended in a no contest to retani the NWA National heavyweight title. May 31, 2014 – NWA Houston: Byron Wilcott defeated Lou Marconi to retain the NWA North American heavyweight title. July 26, 2014 – NWA Smoky Mountain: Lou Marconi defeated Nick Hammonds to retain the NWA National heavyweight title. August 22, 2014 – NWA SAW: Lou Marconi vs. Jeremiah Plunkett ended in a time limit draw to NWA National heavyweight title. November 8, 2014 – NWA Atlanta: Lou Marconi defeated Andy Anderson to retain the NWA National heavyweight title. December 12, 2014 – NWA SAW: Lou Marconi defeated Jeremiah Plunkett to retain the NWA National heavyweight title. February 6, 2015 – NWA SAW: Jax Dane defeated Lou Marconi to win the NWA National heavyweight title.